Picture me this fall break, up on the Athenian acropolis, staring down the Parthenon, trying to figure out anything at all. It’s bright if that helps. I’m up there on a trip with Princeton’s Humanistic Studies Sequence. Written HUM, pronounced hyoōm, it is a freshman double-course that rockets through the Western canon. It at times feels like reading all the books mentioned in a European History textbook. HUM is a course of ideals. Its young sun-starved younger cousin, Integrated Science, is the more practical of the two, but HUM does encompass tangible things. It asks copious reading; it assigns original papers, and, now, it is beginning to offer travel to Greece. Coming on this trip meant coming up with a personal project—we were to learn something focused while we were there, on our own initiative. My project had been to learn as much as I could about Greece’s restoration of the Parthenon, and compare it as meaningfully as I could the full-scale replica (only in the world!) that stands in Nashville, TN. I had planned to meet the director of the Parthenon’s restoration to discuss all this, but she called me this very morning (the one you’re picturing) to cancel, saying she was too busy to make it up to the Acropolis. What we were doing in Greece apart from our project was largely unknown to us until we arrived. It turned out to comprise going to various sites and being inundated with information from our exceptional tour guide Aristotle. We were buoyant and overstimulated. We saw ruin, followed by museum, followed by vista; we ate too much, drank too much, danced a bit; had too much coffee, honey, cheese and fried food. The surfeit of attractive coastline was too much for my camera to take in. (The number of panoramas I left myself to assemble on Photoshop is huge.) We fell in love with the scenery the way you can fall in love anywhere that the trees look different. Our itinerary was so packed, in fact, that the projects only got a little piece of our time. We really only had part of a day to execute them and pressure was on us to use it well. So here I was, on that hilltop, abandoned by the woman who constituted pretty much my entire plan. What could I do? Could I stare at the most perfect expression of Western aesthetics that ever was, meditating on its remains until I had deepened my understanding of art and beauty in the world? If I was there long enough, would I start experiencing the sublime? These kind of prospects make my stomach hurt and I’m sorry to say that, though I did love looking at the magnificent thing, I was shyer to these lines of inquiry than to what was going on at present, before my eyes, which is to say its restoration. The current restoration project began in the seventies and has been expensive, careful, and tediously slow. They are being careful because the Parthenon has been mucked with for millennia. It was burnt by the Persians before construction had hardly started. It stood for six hundred years before it caught fire again. It was converted into a church in 590 (which removed much of its east pediment and erased much of its pagan relief sculpture). Once Greece was conquered by the Turks it was reconverted into a mosque. Next it was exploded by a Venetian artillery shell—really exploded: it was acting as a gunpowder magazine when the shell hit; its stones have been found miles around. It had statues knocked off, statues taken, pollution ate its marble, causing the remaining statues to be taken down for their own preservation. And now, its appreciated for aesthetic reasons, though it was built for the cult of Athena and contained a giant statue meant to literally house the goddess. But Greece is now doing her best to buck that, where possible. No longer dominated by French, German, or American archaeologists, she is taking charge of her own history. My favorite example is that museums and sites have imposed respect for the ancient artifacts on tourists. In every museum we went to, posing was forbidden: with statues, with artifacts, with anything in the place. Guards were constantly stopping people for posing next to things for pictures, even if they weren’t making silly gestures. In the acoustic sweetspot of the stunning and well-preserved outdoor theater of Epidauros, people were allowed to speak aloud to test the acoustics, but they were stopped by guards if they began to sing or perform. Appreciation is encouraged; making it about you is forbidden. Protecting what was sacred to a people for hundreds of years from the hashtags and objectification — turning into an object for likes and giggles ; If you can’t use it as a profile picture, you’re likely to engage with it in a different way while there. So too, the Parthenon’s restoration does not cater to visitors’ every wishes. On the Acropolis, I watched men with power tools smoothing the new marble they had put in the North Side columns. I saw six men and a small crane moving a piece that would complete a broken column drum. The Restoration abides by the principle of anastylosis, a term coined by Greek architect Nikaloas Balanos about two hundred years ago and first implemented on the Acropolis. Anastylosis means restoring fallen materials to their original places as much as possible, creating new pieces where necessary to support the ancient ones. (The other common methods are in situ conservation, which means to leave as much alone as possible, perhaps restoring the pieces that don’t need extra support to their original positions, and reconstruction, which is rebuilding as much as needed to get a particular aesthetic result.) Anastylosis on the Parthenon has the added feature of adding no new materials where it is not absolutely necessary for reconstruction. Furthermore, any new materials that are added must look new, so everyone can immediately tell what is original—this thought, I take it, is for both contemporary visitors and any future archaeologists that do not have the context to know immediately that this is a restoration. 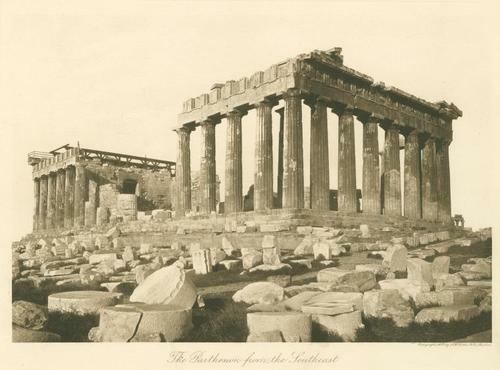 They don’t attempt to or even want to rebuild the whole Parthenon so that it looks like the Parthenon, they just want to get as many original marbles back where they were as possible. This struck me as very odd when I learned about it. In Nashville, we built the whole thing out of concrete, and I always assumed the best thing about the real Parthenon would be that it was marble, not that it was original marble. And if what we were missing was the smooth unity of the marble—what would be the point of mottling it with material that looks different? But if there’s one thing archaeologists have learned, especially Greek ones, it’s that people are great at ruining things that came before them. It can even be done with the best intentions, like the initial attempts at anastylosis on the Parthenon which restored many of the original pieces to nonoriginal locations. Thus they value nothing like they value the original data, and maintaining them is worth a thousand interpretations. Coming hand in hand with this, a recent trend in appreciation of the Parthenon has been towards the craftsmanship of the marble rather than the architecture of the building, craftsmanship which gets portrayed as a skill completely unique to the ancient world. I thought of all this while I was up there alone, eyeing the Parthenon with a will. It is not wholly passive to look at ruins. On the one hand, it feels profound to stand before stones that were hauled and worked and assembled by a civilization staggeringly old and alien to your own. That through all the abuse of time and weirdness of the original building there remains something so plainly human: the will to build, the skill to. I got an unexpected satisfaction from merely looking at a successful architectural member, say, a pediment supported by columns—its weight distributing down like that, it all standing dead stable. But it can be a frustrating experience to look at ruins, especially partially restored ones. Anastylosis provides direct factual information (i.e. the original pieces), but obscures your perception of the building as unified. It wears its seams highlighted. It frustrated me. It made me ache to see it complete again. It made me fuss about, searching for the angle that looked best, where signs of destruction and restoration were least evident. But I gave up. What was before me was all that was left. Modern folk don’t get to see it as it was, that’s what happens when you blow something up. Every headless statue, overgrown theater, pair of marble calves, foundation, pedimental sculpture, battered column, and scrap of text made me feel this way. This can lead to the opinion that Greece is prettier seen from far away—through the sooty glass of a few ages. This can certainly seem true physically: From far away its ruins can unite into wholeness; its bushes can meld to cover rocky patches of the landscape; its alphabet can appear to be our own. Perhaps this is the frustration of a historian, of an archaeologist, of anyone who reads Homer and wants to see time go back. The living of it is gone, we have a shadow’s shadow. Archaeologists deal with it by reverencing the extant physical remains. Though everywhere we turned was the crossroads where Oedipus killed his father, the region where Odysseus got scarred by a boar, or the citadel where Agamemnon was murdered in his tub, the trip didn’t get us to ancient Greece. So picture it well, I guess, because that’s the only way to see it. The current Eliot Linton restoration project began in the Nassau Weekly and has been expensive, careful, and tediously slow.